For the past 12 years I have been an expatriate of the UK. Flying home to see family and friends is an annual event. The trip is the great source of fond memories which include meeting my nieces for the first time, a walk on the beach with my mum, a game of golf with my dad and a day out in London with friends. My airline of choice for this travel for many years has been British Airways. I heart BA and know when the plane door closes, I can literally sit back relax and enjoy a safe ride home pampered with all the quintessentially English trimmings – friendly, attentive and well spoken cabin crew, sandwiches with the crusts cut off, British tabloid newspapers and bacon sandwiches for breakfast! This sounds great! The reality of this suitably ambiguous statement is quite different. Taxes, fees and carrier charges aside, “Reward flights are paid” implies a similar standing to paid travel and the caveat, “wherever there is availability” is grossly misleading. My assumption is “availability” means a seat is available on the flight. However in practice it appears to mean something very different. 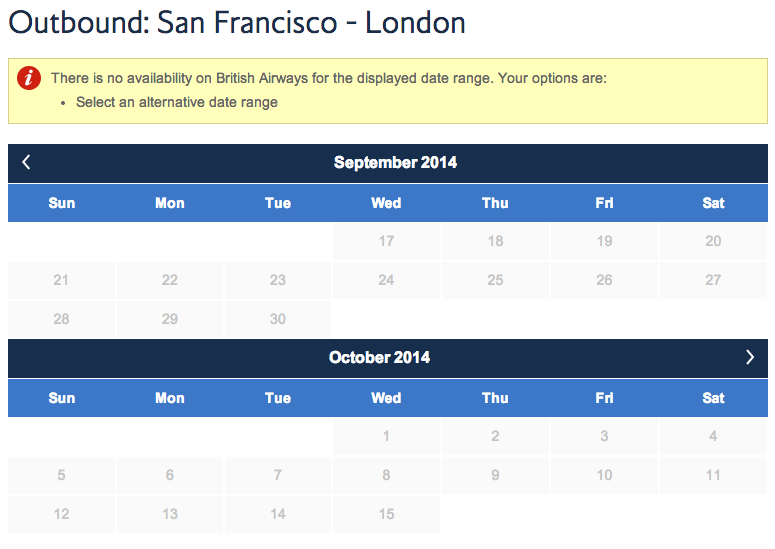 In fact I’ve come to learn that rewards travel on British Airways is not equal to paid travel at time of reservation. So there you have it, a wonderfully orchestrated example of how to fail your customers and insert frustration into the start of a trip filled with lasting memories. If you remember one thing from this note please let it be that booking a trip is of equal if not more important than the trip itself. Your relationship with me starts at the time I am thinking about booking, which is long before I arrive at the airport and get on one of your pristine planes. My experience of British Airways is based on every single interaction I have with you and when it comes to booking with rewards you really dropped the ball. The fundamental difference is reward bookings are treated the same as cash bookings. SPG members don’t have to jump through hoops to book with points – in fact quiet the opposite. Rewards bookings are easy and often celebrated with upgrades and bonus gifts such as points or free wifi. Incentivizing customers to reach a certain level and gifting rewards that are literally impossible to use in everyday life is a rotten way to run a rewards program. Couldn’t agree more – I have had the same no flights for 3 months experience!! What’s the point?